Will the Last Person to Leave the West Wing Please Turn Out the Lights? 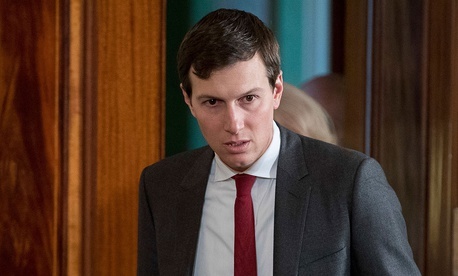 Dip­lo­mat­ic back chan­nels, far from be­ing in­ven­ted by Don­ald Trump or his son-in-law Jared Kush­ner, have been an ac­cep­ted fix­ture in al­most every pres­id­ency since George Wash­ing­ton, most fam­ously at the time of the Cuban Mis­sile Crisis in 1962 when Pres­id­ent Kennedy’s broth­er, Robert F. Kennedy, was more en­gaged than his sec­ret­ary of State. Pres­id­ent Wash­ing­ton en­cour­aged Al­ex­an­der Hamilton to hide his talks with a Brit­ish gen­er­al from Sec­ret­ary of State Thomas Jef­fer­son. Wash­ing­ton knew Jef­fer­son was hos­tile to nor­mal­ized re­la­tions with the former en­emy and kept him in the dark un­til form­al re­la­tions were opened in 1791, ac­cord­ing to Wash­ing­ton bio­graph­er Ron Chernow. That proved more demon­strably suc­cess­ful than Kennedy’s 171 years later. Even be­fore the So­viet mis­siles were spot­ted in Cuba, At­tor­ney Gen­er­al Kennedy had de­veloped a close re­la­tion­ship with Georgi Bolshakov, a So­viet GRU agent he had in­vited to his home, met with al­most three dozen times, and taken mes­sages from for his broth­er, the pres­id­ent. But, as Evan Thomas notes in his 2000 bio­graphy Robert Kennedy. His Life, Bolshakov had misled him about the mis­siles, in­sist­ing they were only de­fens­ive. Kennedy soon learned that the Krem­lin had in­ten­tion­ally kept Bolshakov in the dark so he could mis­lead Kennedy. “Bolshakov’s un­wit­ting de­cep­tion il­lus­trates the draw­backs of op­er­at­ing through go-betweens … and back chan­nels,” wrote Thomas. It also ex­plained why, in the midst of the mis­sile crisis, Kennedy made more use of an­oth­er back chan­nel—So­viet am­bas­sad­or Anato­ly Dobryn­in. A key mo­ment was when Pres­id­ent Kennedy had his broth­er meet secretly at the Justice De­part­ment with the am­bas­sad­or to send a mes­sage that the United States was will­ing to re­move its mis­siles from Tur­key to de­fuse the crisis. The long his­tory of back chan­nels winds from Wash­ing­ton through Frank­lin Roosevelt’s use of Harry Hop­kins to es­tab­lish dip­lo­mat­ic re­la­tions with the So­viet Uni­on, to Pres­id­ent Kennedy’s use of his broth­er, Richard M. Nix­on’s use of Henry Kis­sing­er to forge an arms-lim­it­a­tion treaty with the So­vi­ets and the open­ing to China, and Barack Obama’s work with the pope to nor­mal­ize re­la­tions with Cuba in 2014. The prob­lem for Kush­ner—and the likely reas­on his back chan­nel is sub­ject to more second-guess­ing than pre­vi­ous secret com­mu­nic­a­tions—is that he proved him­self no Al­ex­an­der Hamilton in his deal­ings with Rus­si­an of­fi­cials dur­ing the trans­ition. While vet­er­an dip­lo­mats were un­con­cerned by his meet­ings and viewed the pres­id­ent-elect as be­ing well with­in his rights to open a dia­logue, many were mys­ti­fied by the steps that Kush­ner al­legedly took to shield his con­ver­sa­tions from U.S. coun­ter­in­tel­li­gence of­fi­cials. The meet­ing, first re­por­ted by The Wash­ing­ton Post last week, brought Am­bas­sad­or Sergey Kislyak to Trump Tower in New York on either Dec. 1 or 2, ac­cord­ing to in­ter­cepts of Rus­si­an com­mu­nic­a­tions cited by the Post. At the meet­ing, which also in­cluded Trump’s first na­tion­al se­cur­ity ad­viser, Mi­chael Flynn, the men dis­cussed Kush­ner us­ing Rus­si­an dip­lo­mat­ic fa­cil­it­ies, pre­sum­ably to keep their talks from be­ing mon­itored by U.S. coun­ter­in­tel­li­gence. Moss is the coau­thor of a new book, Nix­on’s Back Chan­nel to Mo­scow: Con­fid­en­tial Dip­lomacy and Détente. He noted that there is ample pre­ced­ent for such back chan­nels in pres­id­en­tial trans­itions, cit­ing Nix­on’s use of Kis­sing­er to sig­nal the Krem­lin in 1968 that he was ready to work for bet­ter re­la­tions. But he finds no pre­ced­ent for Kush­ner’s of­fer to use highly se­cure Rus­si­an fa­cil­it­ies, re­call­ing that Kis­sing­er made a point of keep­ing the FBI aware of what he was do­ing. It was the State De­part­ment that Nix­on wanted shut out, par­tic­u­larly on China. Cuba may have been the cause of more back chan­nel-sub­ter­fuge than al­most any oth­er for­eign hot spot. In Back Chan­nel to Cuba: The Hid­den His­tory of Ne­go­ti­ations Between Wash­ing­ton and Havana, au­thor Peter Korn­bluh ex­am­ines 50 years of be­hind-the-scenes and un­of­fi­cial talks to free pris­on­ers and inch the United States and Cuba to­ward re­con­cili­ation. Sep­ar­ate from those dis­cus­sions, the meet­ings on the Cuban Mis­sile Crisis were some of the most in­tense. On the day be­fore Robert Kennedy met with the am­bas­sad­or, the So­vi­ets set up a meet­ing between ABC news­man John Scali and the em­bassy coun­selor, Aleksandr Fom­in, who was the chief So­viet in­tel­li­gence op­er­at­ive in the United States. Fom­in and Scali dis­cussed the crisis at the Oc­ci­dent­al Res­taur­ant, a cof­fee shop at what is now the Cap­it­al Hilton, and at the Yench­ing Palace res­taur­ant on Con­necti­c­ut Av­en­ue. Scali, who later would be­come U.S. am­bas­sad­or to the United Na­tions, served as a cour­i­er between the two sides un­til the crisis was re­solved. Korn­bluh sees dif­fer­ences in what is hap­pen­ing today. What sets the Kush­ner-Flynn con­tact apart from pre­vi­ous back chan­nels, he said, is not only the sug­ges­ted use of Rus­si­an fa­cil­it­ies, but also that it came at a time when the Trump cam­paign’s links to Rus­si­an in­terests were a source of con­tro­versy. The same con­cern was ex­pressed by Mi­chael J. Mo­rell, the former act­ing dir­ect­or and deputy dir­ect­or of the CIA. In a Q&A this week with the se­cur­ity site The Cipher Brief, Mo­rell urged people not to over­re­act to news of the meet­ing, stat­ing his lack of con­fid­ence in The Wash­ing­ton Post’s sourcing and stress­ing that too few facts are known at this point. Mo­rell, though, shares the con­cerns of oth­er ana­lysts like Moss and Korn­bluh.